Kotaku reader Ben and his special someone Bethany were recently married in Indianapolis, and as you can probably tell by the fact I'm writing about this on the site, they didn't just have a normal wedding. 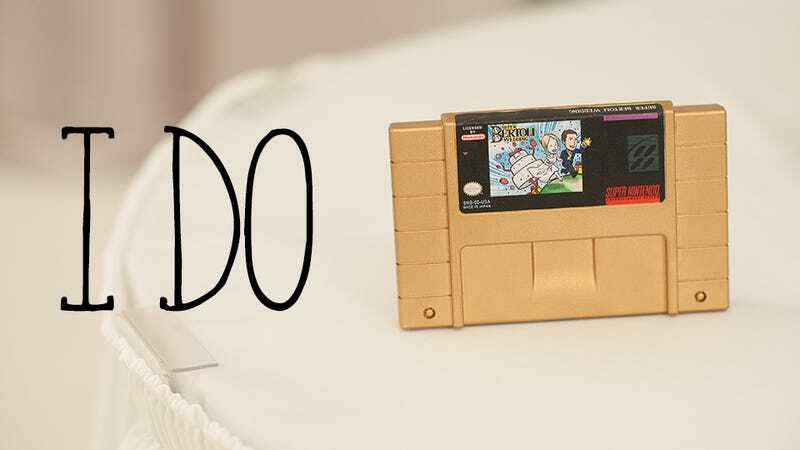 Their ceremony was one catered a little more to our interests, as it included a SNES wedding cake (complete with dummy wedding cartridge designed by the very talented Alice Carroll), Zelda-themed wedding rings, Pokémon cufflinks and a march down the aisle to Zelda's Lullaby. Congratulations, kids! And no, that's not a tear in the corner of my eye. IT'S JUST A DUSTY DAY HERE OK.